Rachel Scott updated her profile. View. Rachel Scott changed her profile picture. Rachel Scott posted a message. 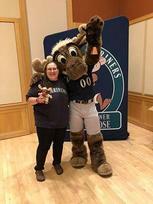 Most current pic taken Thursday (January 17, 2019) at the Mariners Caravan on Whitman College Campus with Mariner Moose! Rachel Scott has a birthday today.